When I was a child, my father was murdered. I still vividly recall the night my mother was contacted about his death and left to identify his body. I missed out on having my father in my life. I was angry for many years. Knowing that the person was arrested and served time didn’t take away the pain and loss. Many years later, on my way to church, my father’s death came up in a conversation with my husband. I told him that, despite my initial anger that my father was not alive to see the many things that happened in my life, I had forgiven the person who took his life. That person would have to live with the memory of what he did, as would his family, including his own children. It’s never easy to deal with the loss of a loved one. While I worked to overcome the grief, I don’t believe that a death sentence and execution of my father’s murderer would have alleviated my pain. I do believe that people should be held accountable for their actions when they break the law and especially when they take a life. An Individual should serve time for the crime they commit. I also believe in redemption and second chances, which is why I work for the abolition of the death penalty in Florida. 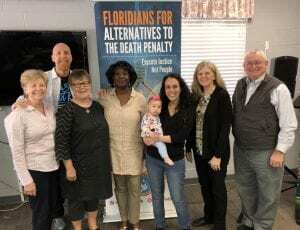 Joyce Hamilton Henry, Ph.D., MSW is a board member of Floridians for Alternatives to the Death Penalty – FADP, the statewide Florida grassroots organization fighting for the abolition of the death penalty. Learn more about FADP’s leadership team and how you can join them in the struggle to end executions.